​When people think of a vacation in scenic Amsterdam, romantic images of boats and canals often come to mind, however driving a car is really the best way to see the city and its surroundings. Automobiles offer convenience and mobility that boats, trains and buses cannot match and due to currency fluctuations and rising prices, rail passes are not much less expensive than a rental car in Amsterdam these days either. Most of the major familiar car rental agencies offer multiple car pick up locations in Amsterdam with large rental car fleets that make finding a car to rent both easy and relatively economical. Amsterdam, like most of the Netherlands, boasts an excellent highway system that makes visiting all the major attractions a short day trip from nearly anywhere in the country. Canals, windmills and tulips line the roadways on the way to the North Sea, The Hague, Rotterdam and Delft. The Netherlands highway system also offers easy access to nearby international destinations in the rest of the Benelux region composed of Belgium, the Netherlands and Luxembourg. A car rental in Amsterdam will give you the freedom to tour at your own pace and allow you to make the most of your trip to the Netherlands or even nearby countries like France, Germany, Denmark and Switzerland that are all within a day’s driving distance. 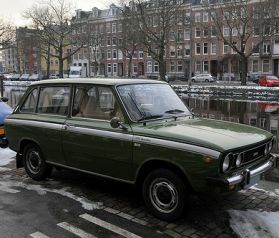 To rent a car in Amsterdam you must be at least 21 years and have had a license for at least one year. Drivers under the age of 25 may incur a young driver surcharge depending on the rental agency. Seatbelts and child seats for children up to 40 lbs are mandatory and children under 12 cannot travel as front seat passenger unless they use a suitable restraint system. Fire and third party liability insurance is mandatory for all rental cars, and other optional insurance coverages are also available at the rental counter depending on the type of vehicle rented. The car rental insurance regulations of the country where you first rent the vehicle will usually remain in effect for the duration of your rental period. Most types of rental cars can be driven anywhere in Western Europe without restriction, but due to insurance regulations, there may be restrictions on specific luxury car rentals like the law that bars luxury rental cars in Italy. There are also restrictions on travel to specific countries and cars rented in the Netherlands are not allowed into Albania, Bosnia, Belarus, Bulgaria, Czech Republic, Croatia, Estonia, Greece, Hungary, Latvia, Lithuania, Macedonia, Montenegro, Poland, Russia, Slovakia, Turkey, Ukraine and Yugoslavia. Travel into some restricted countries can be arranged with the right fees, paperwork and enough advance notice however. The rules of the road in the Netherlands dictate that traffic travels on the right and all passing is done on the right. Passing or turning is forbidden on roads with a continuous white line and the speed limits are generally 31mph/50kph in the cities, 49mph/80kph on open roads, and up to a max of 75mph/120kph out on the highways. There are no toll roads in the Netherlands and in order to park a car in the city, travelers must first obtain a time-stamped parking “disc” sold at various shops and police stations. Enjoy the drive.